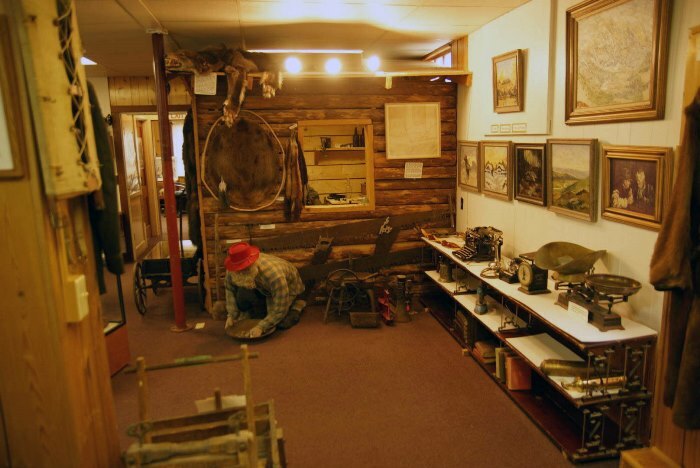 For a taste of the turn-of-the-20th-century Alaskan frontier, take a drive off the main road and out to Talkeetna, Alaska. This town is full of historic charm, as well as modern-day gift shops and tourist attractions. It’s a good base for flightseeing tours of Denali – or just a nice place to hang out for an afternoon. Talkeetna, Alaska, is located at the end of the Talkeetna Spur Road, off of the Parks Highway (Alaska Route 3). 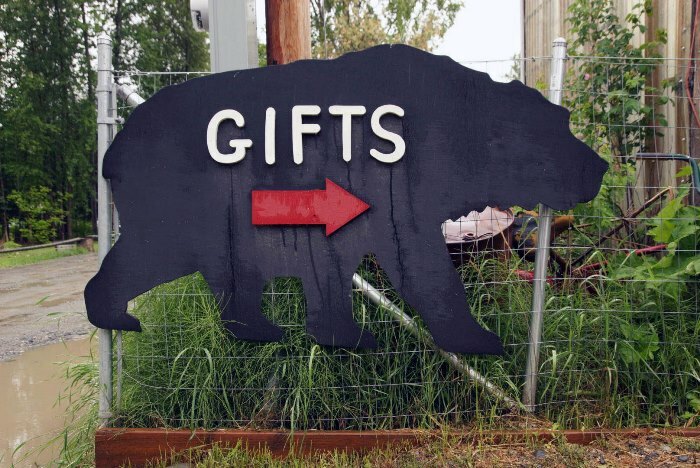 It’s 14 miles from the highway to the end of the road in downtown Talkeetna. It takes a bit of effort to get to Talkeetna, which is why I passed by the road to town on my previous trip to Alaska. A 28-mile round-trip detour is asking a lot, when you’re already making a 330-mile trip up from Anchorage to Denali. On this day, I was headed in the opposite direction, from Denali back to Anchorage, but because of a pouring rain, I needed a break from the drive. Plus, I’ve only heard good things about Talkeetna, so I decided it was a good time to visit. 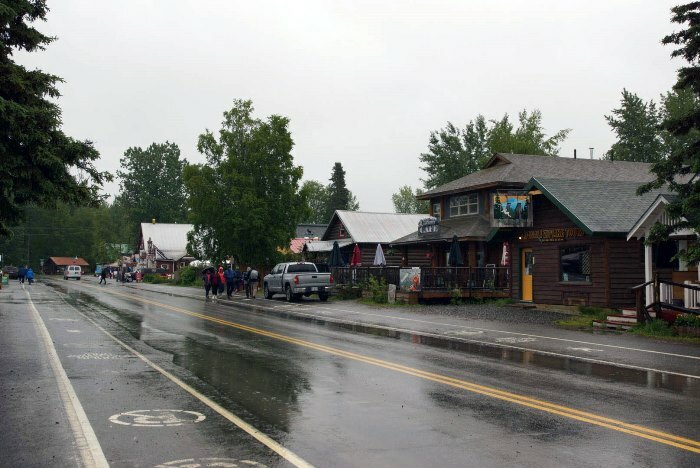 Talkeetna is a town for tourists. 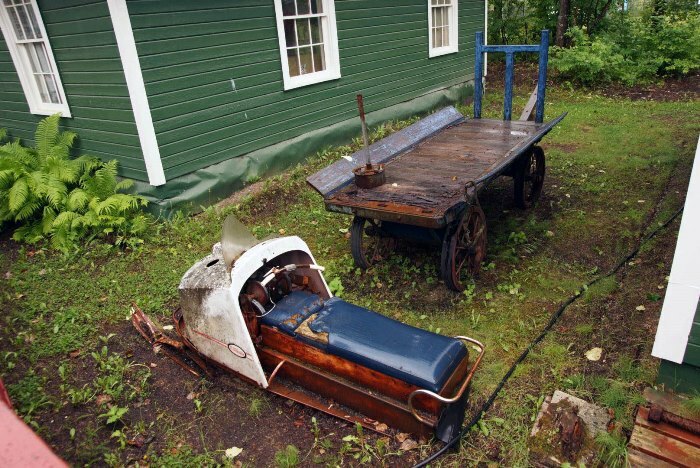 It may have started as a railroad town in the early 1900’s, but nowadays it is packed with gift shops, restaurants, and services like flights over Denali and river rafting trips. 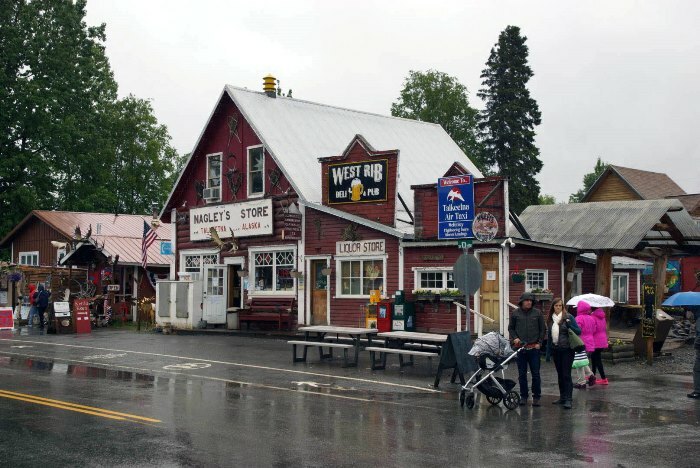 Take the Talkeetna Spur Road into town, and it ends at Main Street. The business district is a National Historic Site, thanks in part to buildings like Nagley’s Store. 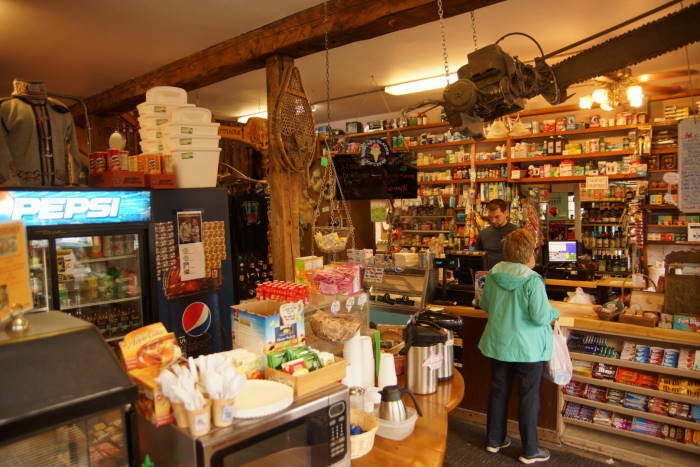 It opened in 1921, and claims to be the longest continually-operated general store in the northern Susitna Valley. Inside, the first floor is not terribly interesting — it’s just a general store stocked with groceries and necessities. 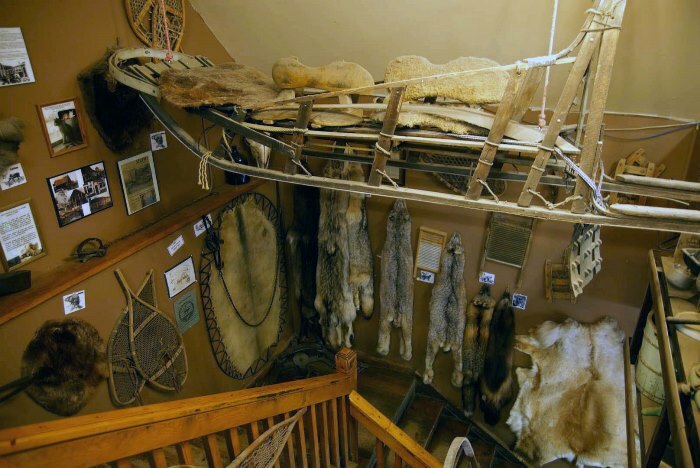 Take the stairs up to the second level, and you’ll see more interesting items from around the area – like this dogsled hanging from the ceiling. 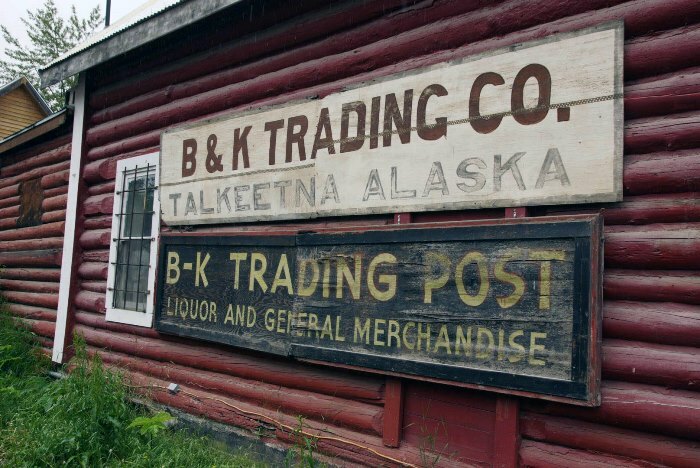 Outside, you’ll find these old signs for the B&K Trading Company. When Horace Nagley sold his store in 1947 and retired, it was renamed B&K. The store changed back to its original name in 1994, in honor of its founder’s contributions to the town. Leaving Nagley’s, I continued down Main Street, hopping from one store to the next, to avoid the rain. Take a detour one block south, and you’ll see this historic-looking building, which now provides public restrooms. 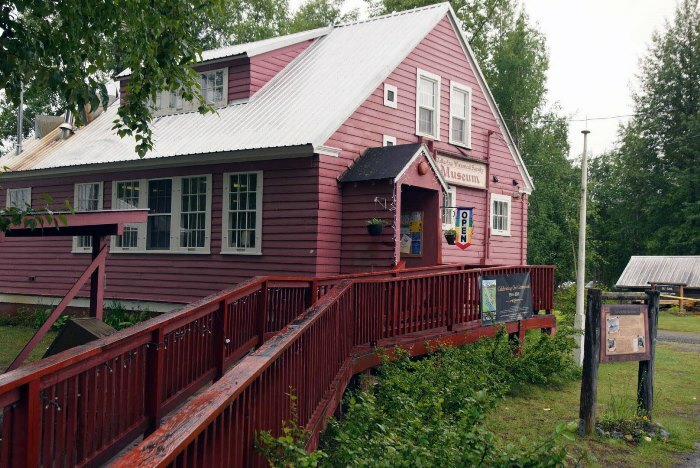 For the reasonable admission price of $3, I found another place to hide out from the rain for a while, and learn a little about Talkeetna’s history. 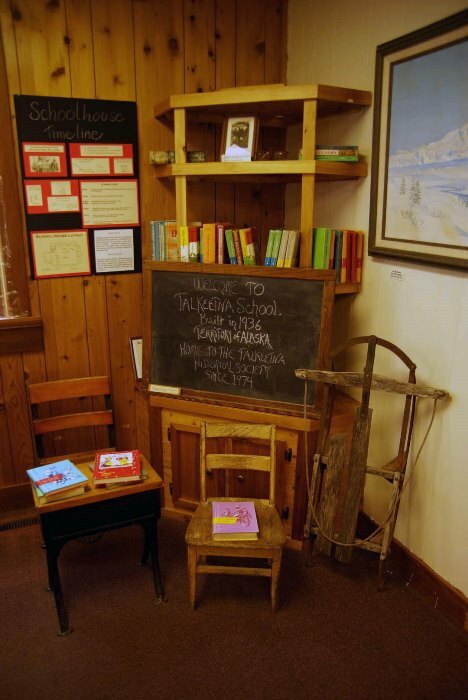 The Talkeetna Historical Society’s museum is located in the town’s little red schoolhouse, which first opened for the 1936-37 school year. 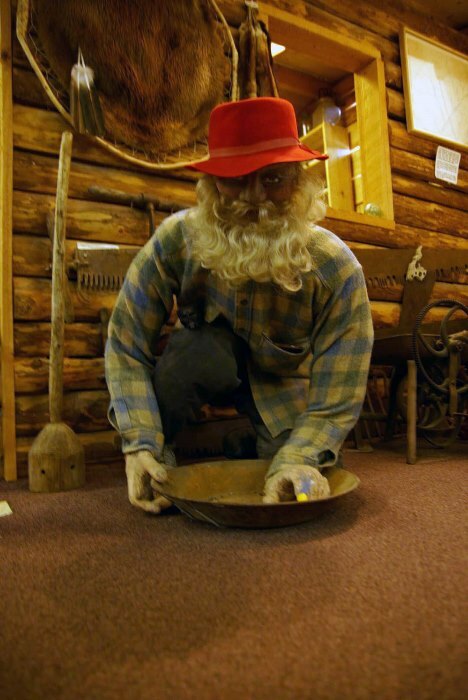 … and of course, a creepy mannequin panning for carpet gold. 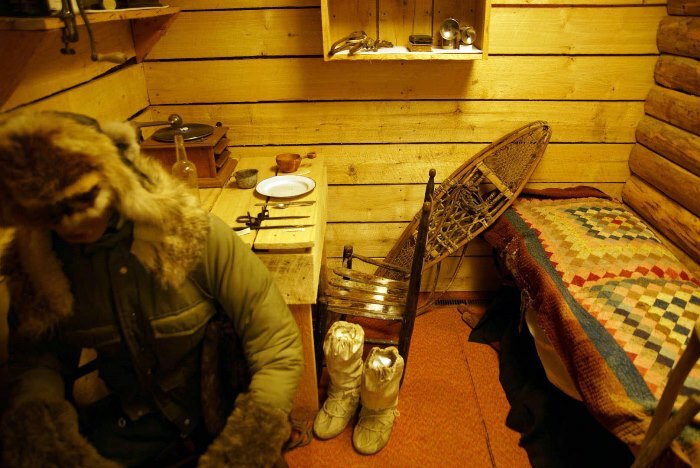 … and another shows a typical home on the Alaskan frontier. Cozy. 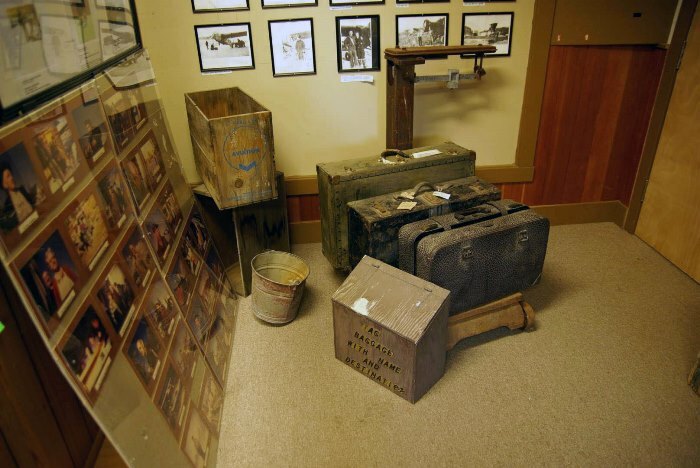 More than a century ago, wolf hunting wasn’t just a popular pastime in Alaska. The territory (and later, the state) issued a bounty on wolves. 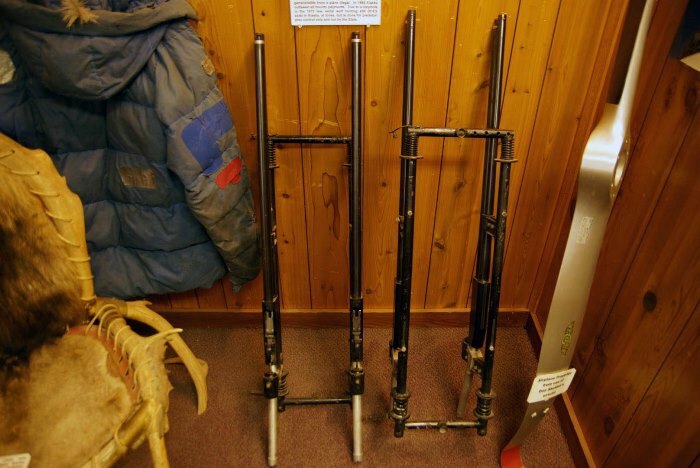 Bush pilot Don Shelton mounted these four 12-gauge shotguns to his plane, and shot wolves from the air, the sold the pelts and collected the bounty. The practice continued until 1972, when airborne hunting was outlawed, and in 1984, the bounty was discontinued. … and signage. 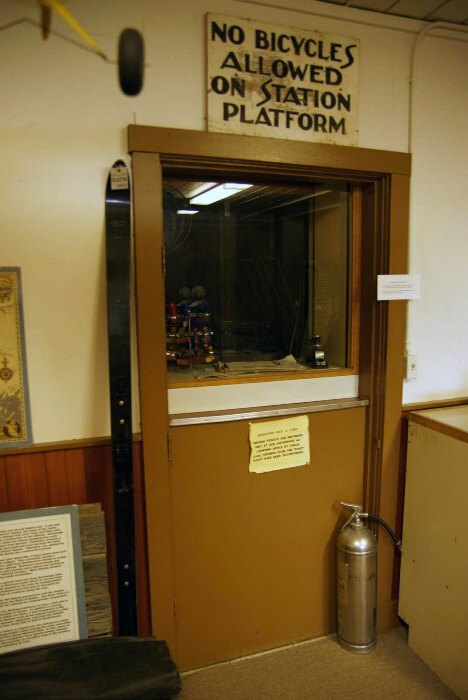 Talkeetna was founded in 1916, as a district headquarters for the Alaska Railroad. Outside, you can check out an old snow machine on the walk between buildings. 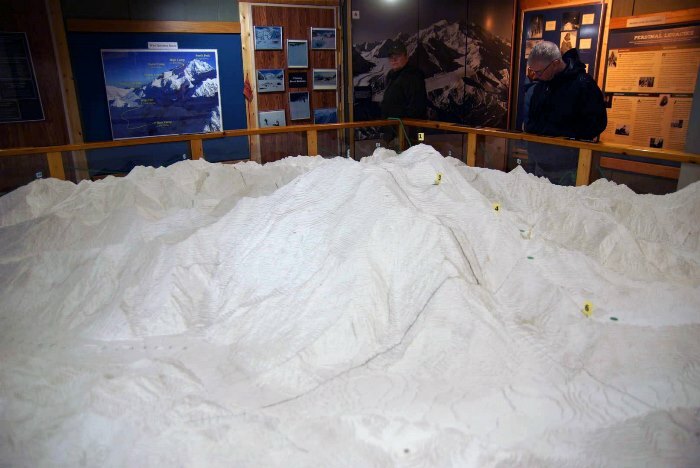 The final stop is the mountain exhibit, which displays a large replica of Denali and surrounding mountains — plus an explanation of climbing routes. 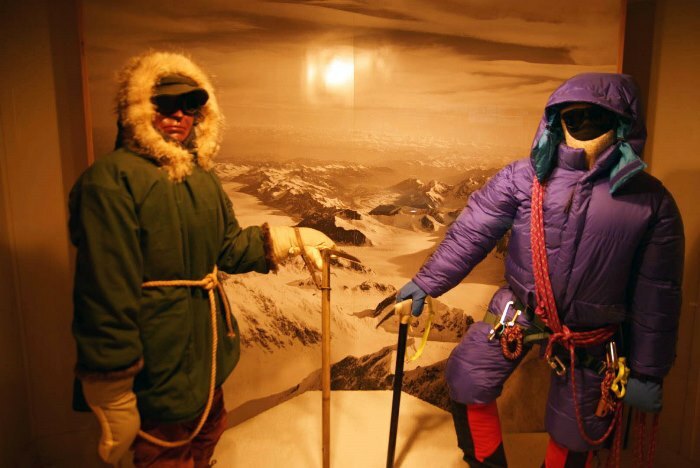 You also get a chance to imagine what it was like to stand at the top of North America, both in modern climbing gear, and the kind of equipment worn by Walter Harper back in 1913, when he became the first person to summit The Big One. Harper didn’t have one modern-day convenience (or inconvenience, depending on your perspective). 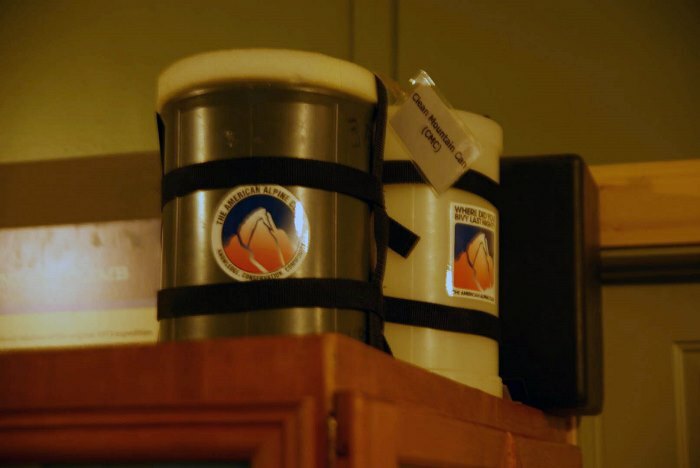 Those are “clean mountain cans”, essentially buckets that serve as portable toilets for Denali climbers. CMC’s are required by the park service for hikers taking the “west buttress” route up the mountain, and highly recommended on other routes. 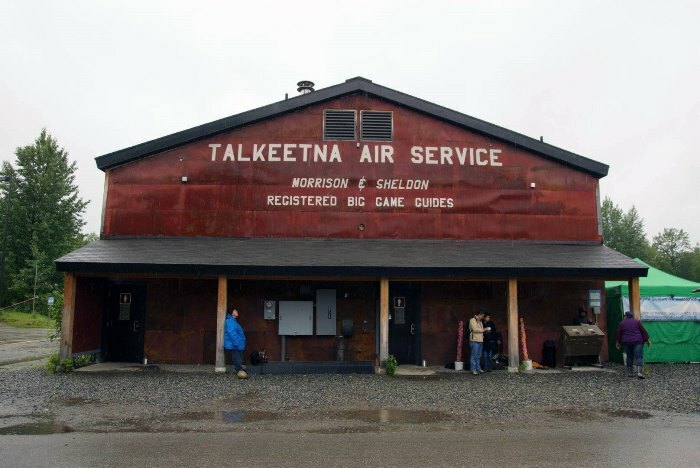 Talkeetna is a great stop for tourists on the way to, or from, Denali National Park. You’ll find quite a few places to eat and buy souvenirs, and a few overnight accommodations, as well as other tour services.